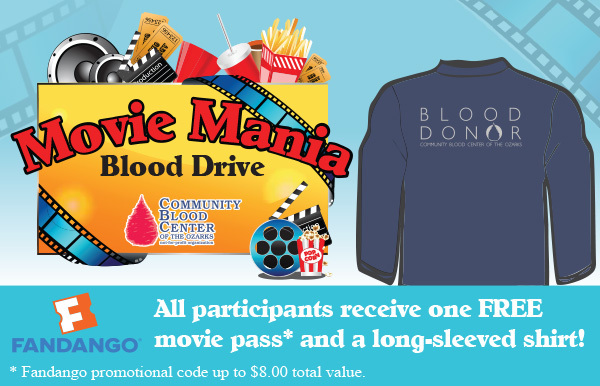 Play a leading role in helping to save the lives of patients in the Ozarks at our Movie Mania Blood Drive on December 24 and 31, 2018! We’ll see you on the red carpet at one of CBCO’s 4 donor centers during our Movie Mania Blood Drive, scheduled for Christmas Eve and New Year’s Eve — Monday, December 24 and Monday December 31, 2018! You may not win an Oscar, but participants will receive (drumroll, please) a free flick — a Fandango promotional code good for admission to one movie (up to $8.00 total value). Plus you’ll get a nifty free T-shirt with long sleeves. How can you make sure you don’t miss the excitement? Click on your closest CBCO donor center from the list below. We’ll whisk you away in our imaginary limousine to set your appointment online. Or have your people call our people. Phone numbers for our donor centers are available here. Set your appointment now! It’s easy. Click on a donor center below and a December calendar for that center will open. 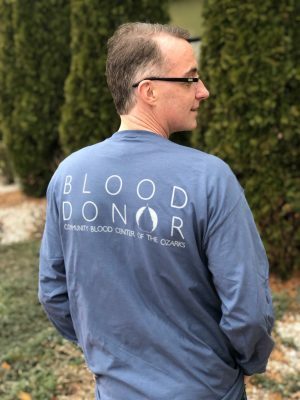 Choose December 24 or 31, 2018, on the calendar, and then click on the type of donation you will be making (Whole Blood, Platelets, Plasma). Can I donate on a different day and still get the free Fandango movie ticket? Sorry, but this promotion is for donations made at our donor centers only on December 24 or 31, 2018, in order to meet the holiday needs of our 40+ local hospitals. We look forward to seeing you at our Movie Mania Blood Drive on December 24 or 31, 2018!